Controlled burns have ended for today, current weather conditions (gusting winds, wind direction changes) have made it unsafe to continue. Further burning will be considered next week, dependent on weather conditions and availability of crews. We would also like to thank the crews from Alberta Agriculture and Forestry for their support. Today we will be conducting a hazard reduction burn in the area behind Misery mountain. Between Misery mountain and the Rolling Hills/Saddleback areas. 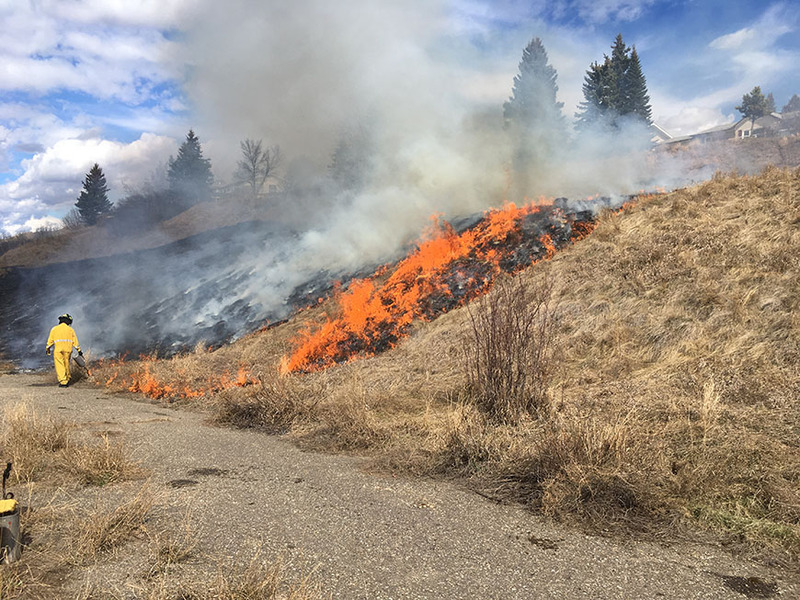 The Hazard Reduction burns in the South End of Town went smoothly yesterday. Today, April 17, firefighters are in the North End of town near the dog park and cemetery for more hazard reduction burns. If time and weather permit, they will be moving on to the Cool Springs and Peace River High School Area. The Fire Department is carrying out hazard reduction burns in Town today. They are beginning in the South End near 101 St. and 99 St.
Once the Fire Department is done in the South End, if time and weather conditions permit, they will be burning an area near Cool Springs and Peace River High School. After that, if time and weather permits, they will move onto the North End near the cemetery and off-leash dog park. Due to the likelihood of rain later today or this evening hazard reduction burns are postponed. We will try again on Tuesday April 16. On Monday April 15 we will be conducting hazard reduction burns in Town. This is to reduce flammable material and wildfire fire hazards in town. Where and when we burn will be dependent on the weather and conditions. – South-end of town – 101 St, 99 St.
– North-end of town – Cemetery/Off-Leash dog area. – High School/Coolsprings area including 90th Ave.